New! Baxt’s Bottle & Bag Baffler: The ‘No Egg’ Egg Bag! THERE WERE ONLY TWO PARTS WRONG WITH THE CLASSIC MAGICIANS EGG BAG TRICK: THE EGG AND THE BAG! Now Robert clears up the confusion of what that strange “never seen before Except in a magician’s act” bag is, by using a recognizable and authentic Crown Royal whiskey purple bag! Then he goes a step further by eliminating the hard to see egg (or is that a ping pong ball, or golf ball? After the third row it’s very difficult to tell!) and replacing it with a bottle of aspirin. Now it can be clearly seen AND heard! Yes, that’s right! A whole new element is added to the trick: Sound! The bottle clearly rattles when it’s displayed, but no longer rattles when it disappears! This proves to the audience that when you say it’s gone, IT’S GONE! Robert has ingeniously added a rattle/no rattle aspirin bottle to the routine and put it all together to create his funny “Field Sobriety Test”. PLUS! FOR FAMILY, HEALTH, AND SCHOOL SHOWS IT CAN BE DONE AS AN IMPORTANT LESSON ON THE DANGERS OF PILLS, INEBRIATION, AND INTOXICATION! Use the same props but emphasize that drinking and drugs (showing the bag and the pill bottle) are bad because they keep you from making good choices. The same routine with “Where is the bottle?” but now an important health message that school officials love! A very visual lesson they will long remember! Price $49.95 WITH SHIPPING INCLUDED IN THE UNITED STATES! You can’t get it cheaper anywhere else! 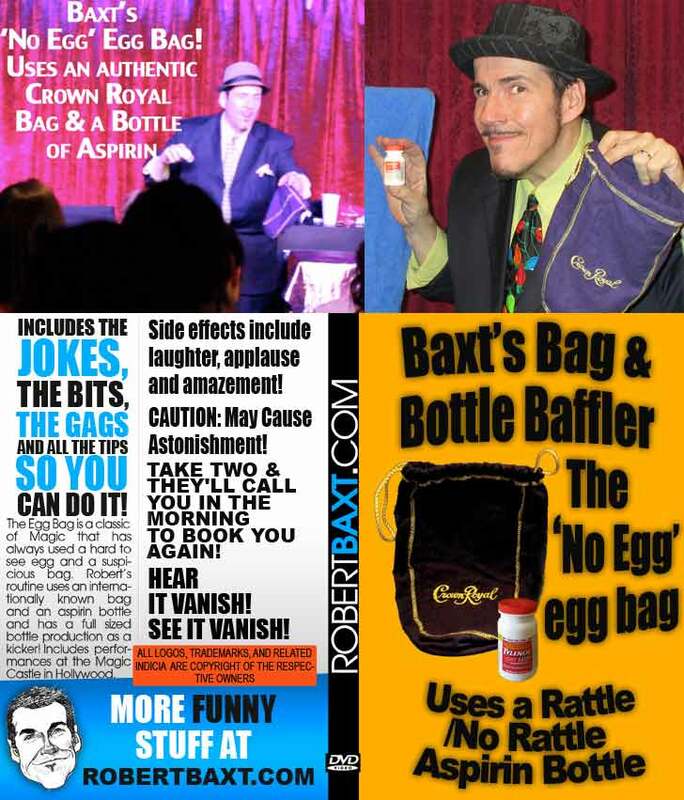 Comes with two gimmicked rattle/no rattle aspirin bottles, the gimmicked hand sewn Crown Royal bag which has an additional gaffe not found in any other type of egg bag, a duplicate non-gimmicked Crown Royal bag, and an instructional DVD that has two different live performances with variations, and step by step video instructions for the routine with tips and advice. *OUTSIDE THE U.S.- With Priority Airmail shipping included: $102.95 BUT! order more than one item from this site and shipping is combined for greater savings! Email robert@robertbaxt.com with your complete order for shipping charges. OUTSIDE THE UNITED STATES: Price $102.95 Includes Priority Shipping To ANYWHERE IN THE WORLD!